Inside the tents are experienced Soldiers and cadre who are tasked as branch representatives to educate Cadets about specifics of the branch assignments. Staff Sgt. Chris Hall of the 57th Sapper Company, Fort Bragg, North Carolina was flown in three times throughout Warrior Forge to talk about his branch and recruit talent for the Corps of Engineers. Other Soldiers were there more to inform rather than recruit Cadets. Within the Corps of Engineers are several different jobs including Vertical and Horizontal Construction, Combat, Sapper, Route Clearance, Bridge, Geospatial, Mobility Augmentation and Prime Power Companies. Officers can’t necessarily perform every duty. For example, only enlisted personnel can be Geospatial Engineers. The 16 possible branches Cadets may be assigned to are broken into three different subdivisions: Maneuver, Fires and Effects (MFE), Operations Support Division (OSD) and Force Sustainment Division (FSD). MFE includes a few of the most sought-after branches such as Infantry, Engineering and Aviation. OSD includes Military Intelligence and Signal, both highly sought-after branches, as well. Finally, FSD includes the largest branches such as Ordinance and Transportation. For some Cadets, like 12th Regiment Cadet Corey Kibwe of Georgia State University, the decision was clear. 12th Regiment Cadet Grant Cook of University of Tennessee at Knoxville has a top choice in mind, and believes his performance at LDAC should help him. Cadets who score high on their Army Physical Fitness Test, maintain high grade point averages and earn ‘E’ scores for ‘excellent performance’ while at LDAC are also placed higher on the order of merit list (OML). The higher a Cadet places on the OML, the more likely they are to be assigned to the chosen branch they want in the Army. Though more than 6,000 Cadets will graduate from LDAC, about half will be competing for the top branch choices. Cadets not going active duty are chosen to go in to the Army Reserves or National Guard. 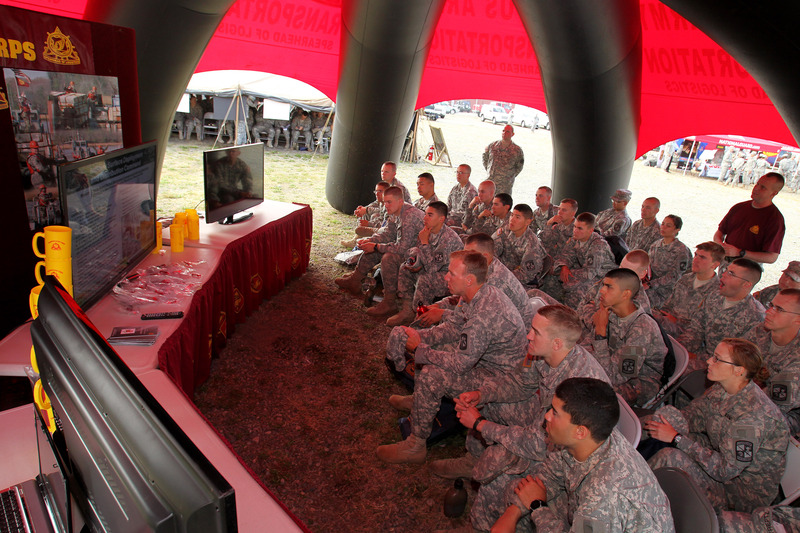 Among the most populated tents at branch orientation are Chemical, Engineering, Military Police, Ordinance and Infantry. The Chaplain tent hosted about six Cadets at a time. The purpose of branch orientation is for Cadets to explore many opportunities and hear the personal stories of experienced Soldiers. 11th Regiment Cadet Caleb Perkins of Temple University was torn between branching Ordnance and Signal. He said Explosive Ordnance Disposal (EOD) within Ordnance interested him, while Signal interested him because of the opportunities in the civilian job world. “I don’t want to just plan for the immediate future,“ Perkins said. It is difficult to place every Soldier where they want to be, but with the OML, the most deserving Soldiers will have earned their desired place in the Army. “You get more productivity from an individual if they are happy in their job,” Rosenberger said.